Manhattan real estate prices have always been crazy — but a wealthy Russian banker has discovered that $57.5 million won’t even buy you a whole East Side mansion. The banker closed on the $42 million deal for 33 E. 74 St. last week — but just for the first four floors of the seven-story condo building. The buyer of the 10,088-square-foot, five-bedroom, five-bath unit in the building, known as the Atterbury Mansion, was not identified, but The Post has learned he is Alexei Kuzmichev. But more than 10,000 square feet apparently wasn’t enough room for Kuzmichev — who also bought an additional three-bedroom, 3,800-square-foot unit for $15.5 million in the building immediately to the west of the Atterbury Mansion. He plans to connect the two units, sources said. The sale was first reported in the Wall Street Journal, which did not report the buyer’s name. Kuzmichev made his fortune courtesy of the Alfa Group. Most of Alfa’s founders — including Mikhail Fridman, Peter Aven and German Khan — met as members of the Komsomol, the Young Communist Party and came of age during Russia’s black marketeering boom in its transition to a “gray economy,” according to Russian sources. They created Alfa Bank in part to buy former state-owned companies on the cheap through Russia’s rigged privatization sell-off during former Russian leader Boris Yeltsin’s leadership, according to a Russian source. However, unlike its competitors, Alfa Bank did not stiff working-class Russians and stayed open during Moscow’s 1998 economic crisis. Kuzmichev’s current net worth is estimated at $7.3 billion, according to Forbes. The Atterbury mansion was built in 1901 by the architect Grosvenor Atterbury for another banker, Julian Wainwright Robbins, and his wife, Sarah, who was the niece of Cornelius Vanderbilt. Later it was then part of a nine-building compound owned by the Whitney Museum of American Art that has been restored and transformed into living spaces by developer Daniel Straus, who bought the compound for $92 million five years ago. Straus restored the landmarked façades of the buildings, but received city approval to destroy their insides, renovate and create a 10-unit nearly block-long luxury condo. The first crop of post-Soviet billionaires still have a profound presence on the New York trophy real estate scene. Len Blavatnik, Kuzmichev’s billionaire crony and serial New York real estate buyer, paid $80 million for New York Jets owner and shampoo heir Woody Johnson’s co-op at 834 Fifth Ave. — where Wall Street titan John Gutfreund currently has his duplex on the market for $120 million. A third Russian billionaire, Roman Abramovich, bought three Upper East Side mansionsat nearby 11-15 E. 75th St., as The Post exclusively reported. 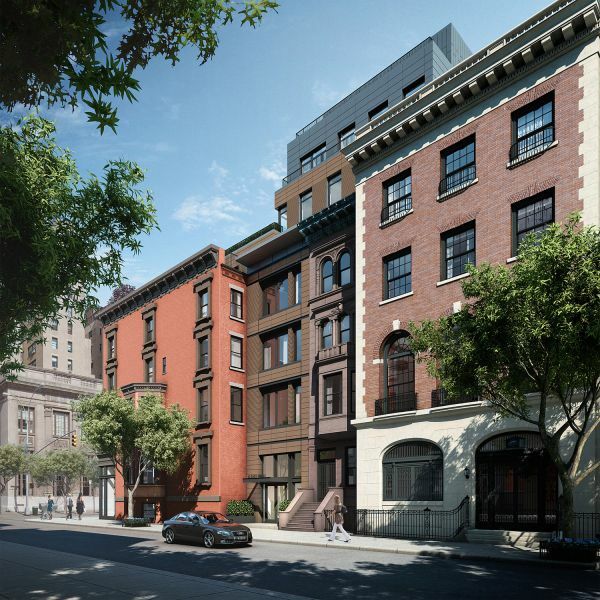 Abramovich hopes to join them to create a megamansion after he receives approval from the landmarks preservation commission. Douglas Elliman’s Katherine Gauthier, Lauren Muss and Richard Steinberg brokered the 33 E. 74th St. deal.